In this post, I’ll show how to optimize and display color 3D scans in any WebGL-enabled browser using BabylonJS. I’ll be using Kinect for Windows for my 3D Scan, but you should be able to use these steps using other 3D Scanners as well. 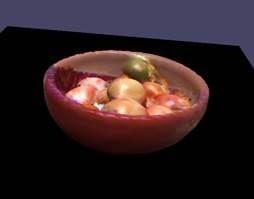 Click the images below to see a couple of sample 3D scans – a monkey and a fruitbowl. 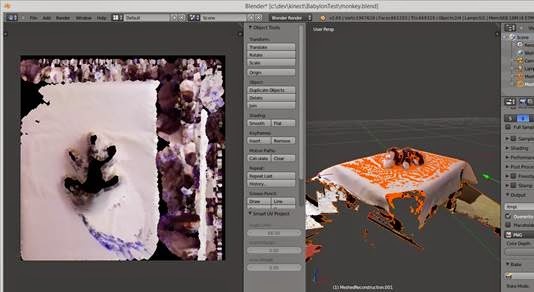 The idea of using the Kinect for creating 3D Scans has been around for a while, and there are commercial packages such as ReconstructMe and Skanect which provide an easy interface for 3D Scanning. However, these packages have limitations and costs associated with them. Kinect for Windows SDK (and Developer Toolkit)Download the latest SDK and Developer Toolkit to enable scanning using Kinect Fusion. 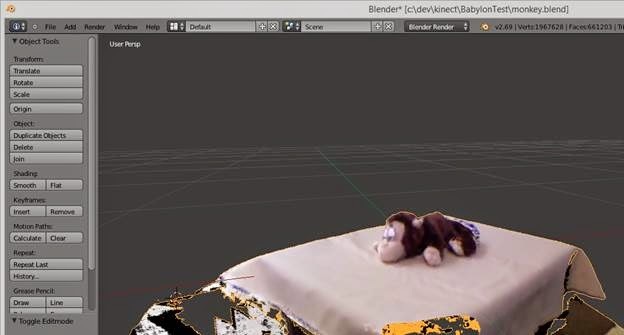 This plugin for Blender allows you to export a Blender 3D Scene to Babylon format. Download the plug-in and read the install instructions from the link to make it available in Blender. First load the “Developer Toolkit Browser” which was installed with your Kinect Developer Toolkit. 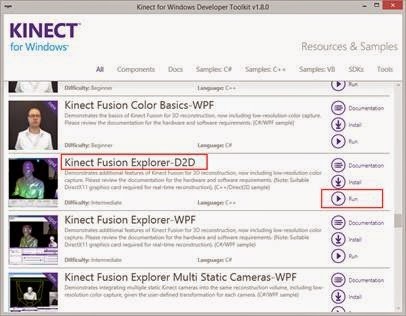 Scroll down and run the Kinect Fusion Explorer – D2D sample. You will also likely need to tweak the Reconstruction Volume and Voxel Resolution settings. For my close-up scans, I found the following settings to be the best, but you will want to try different settings for your particular scene. Once you capture all angles, click the “Create Mesh” button to save a .PLY format file (which includes color information) to disk. At this point, we have a large amount of data in a very large file, so in order to display it in a browser using BabylonJS, we will need to optimize it. We also need to clean up the model and smooth it a bit, as the 3D Scan adds unwanted artifacts. To do so, we will use Blender. If you are not familiar with Blender, you may be a bit overwhelmed at first – but stick with it, it’s a valuable and fun tool! 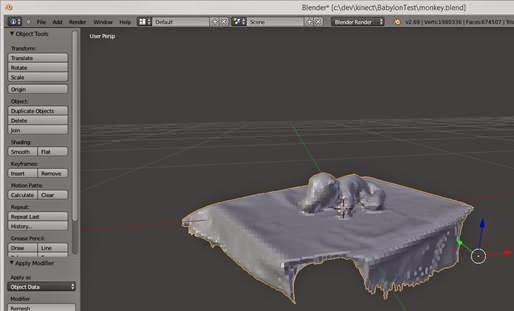 This post will not include all of the little details on basics of using Blender. 1) CREDITS go to CrowTreeStudios for the vertex color baking process! For a video walkthrough of these steps, see their video here. a) Browse to the PLY file that you exported in Step 2 above. b) This might take a little while, the scans are large! 5) Make a copy of the object, by first selecting it and then select Object / Duplicate Objects. In the next steps, we will optimize this copy (by reducing vertex count) and then create a texture map for it using the original mesh’s vertex color information (this is called “Vertex Baking”). a) Important: Make sure that both the original mesh and the copied mesh are in the exact same Position. This is necessary for proper vertex baking! They should appear in a perfect overlapped position at this point. 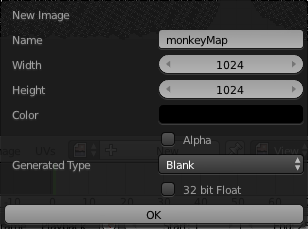 If you need to tweak, just go to the Object properties panel and set the Location X,Y, and Z. 6) Next, we will optimize and cleanup the mesh, so that it appears smoother and is not so huge on disk and in memory. a) Hide the original mesh so you can concentrate on the duplicate mesh. c) Activate the Modifies panel and select Add Modifier. d) Select ReMesh and adjust the Octree Depth up to 6 and the Mode to Smooth. Observe the shape of your modified mesh and you may need to increase or decrease the Octree depth for the proper smoothing and cleanup. When you are happy, click apply. This reduces the vertex count and smooths the scan data out a bit. a) Show the original mesh again by making it visible. 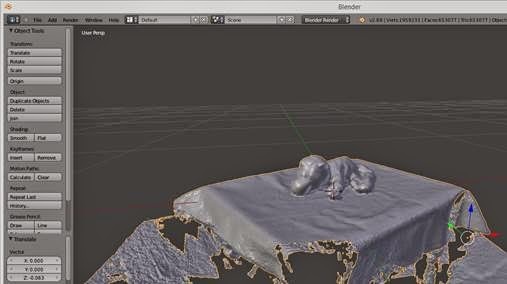 8) Add a material to original, scanned mesh. d) under options, check "Vertex Color Paint"
10) Now, we can see the scanned in vertex color data from the original mesh. In the next steps, we will create a Texture map from this color data (a process known as Vertex Baking). 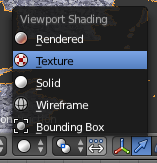 c) under shading, select "Shadeless"
12) Next we need to unwrap the mesh, as a setup for creating a texture map image. 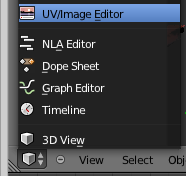 e) hit "U" for unwrap and then select "Smart UV Project"
13) Now we’ll create an image to store the texture map. 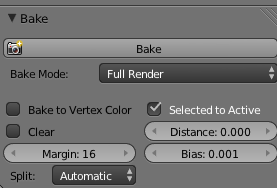 b) Give the image a name and uncheck Alpha, then click OK.
14) For proper vertex color baking, we need to change the default color management in Blender. b) Under Color Management, set Display Device to None. 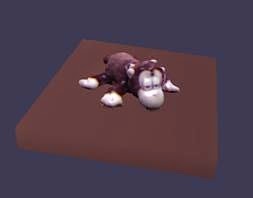 15) No we can Bake our Color Vertex Data to a Texture Map. a) check "Selected to active"
18) Save your texture map to a local file. 19) Now we’ll apply this texture map image to the optimized mesh. 20) Now that we have both a Texture Map and an Optimized Mesh, we can delete the original (scanned data) mesh from the project. a) Select the original mesh and delete it by selecting Object/Delete. 21) Export the Scene to Babylon format. 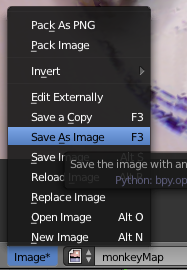 b) The export should create two files: a *.babylon and a *.png (texture map) file. Now that we have a *.babylon scene file and a *.png texture map, we can easily load and display our 3D Scan using BabylonJS. 3) Create a new HTML file, and add the following code to create the Babylon scene from the exported Blender scene file (comments are inline). Once again, you can see samples of this process a here and a here. As you can see, it is a bit of work to optimize a mesh for display using WebGL, but by mastering these steps we have ultimate control over the size and detail of our meshes. And using WebGL and BabylonJS, we have a cross-platform solution which works in IE11, Firefox, Chrome, and even some mobile browsers. This was really a well written blog. I had the best experience reading this blog and gained a lot of new ideas reading this blog. (c) 2004-2014 Andy Beaulieu. Powered by Blogger.